And to think that only a couple of years ago, Caroline Kurgat was afraid she would lose her college scholarship because she wasn't running fast enough. Kurgat, who ran to three national championships for UAA during the 2017-18 school year, Tuesday was named the NCAA Division II athlete of the year by the Collegiate Women Sports Awards program. She'll receive the award in a nationally televised presentation June 25 in Los Angeles. Kurgat will be honored along with the Division I and Division III athletes of the year, who have not been selected yet. Stanford swimmer Katie Ledecky was last year's Division I winner. Kurgat is the first athlete from UAA or the Great Northwest Athletic Conference to win the award, which was first presented in 1988. Kurgat, 25, came to UAA in 2014 from Eldoret, Kenya, a high-altitude city known for its elite runners. 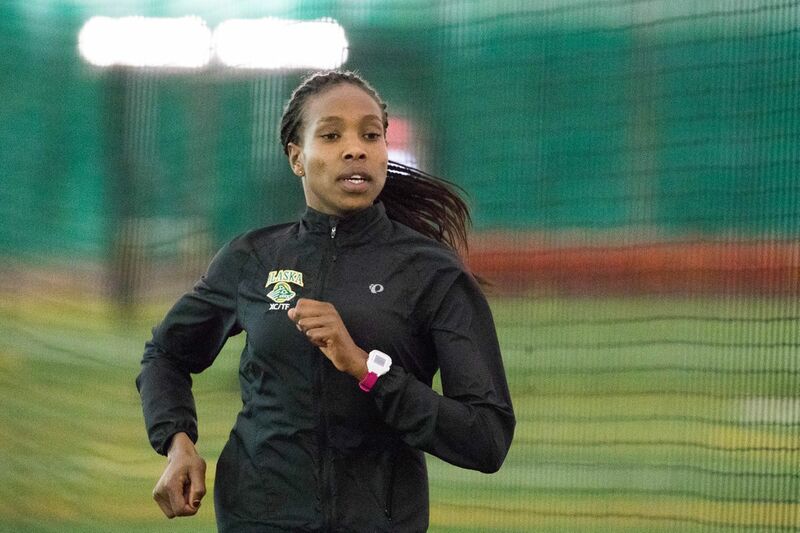 She's one of several Kenyans who have excelled at UAA as both runners and students, although she came to Anchorage with fewer running credentials than most. "I didn't have good times," Kurgat said. "They accepted me because they knew they would make me run. They made me the runner (I am)." Kurgat said she was a runner in Kenya, but not a serious one. Running became more important when it was time to go to college and she realized she would not be able to pursue her chosen field — nursing — in Kenya. Students are assigned a major in Kenya, she said, and she was assigned something that had nothing to do with medicine. An aunt urged Kurgat to look for schools in the United States with a nursing program and a track team. In UAA, Kurgat found a school that had both of those things, plus a history of recruiting Kenyan runners. When Kurgat first got here, she lived with Micah Chelimo and Joyce Kipchumba — a pair of fellow Kenyans who were outstanding runners for UAA. She learned how to balance classwork with training, but she feared that her days with the Seawolves might be numbered because she wasn't as fast as many of her teammates. "It was really difficult at the start," Kurgat said. "I didn't train much at home, so that was a totally new thing here — going to school and running. "At first I didn't enjoy it. I was frustrated, kind of. The training wasn't that easy, you know, so it took me time to catch up." During her first semester at UAA, Kurgat finished 23rd at the West Region cross- country championships to qualify for the 2014 Division II national championships. She placed 46th. As the school year progressed, her performances improved. During the outdoor track season, she earned Freshman of the Year honors in the Great Northwest Athletic Conference after placing third in the 10,000 and sixth in the 5,000 at the GNAC championships. "Just qualifying for nationals was a huge thing for me," Kurgat said. "Then I started training more my second year." Her results improved substantially. As a sophomore, Kurgat placed sixth at the cross-country national championships and sixth in the 5,000 meters at the outdoor track championships. She stayed in Anchorage during the summer of 2016 and amped up her training even more. She got faster, and she got more confident. "I just started feeling like I can do it," she said. "Just knowing the more I train, the more I get better, the more I get fit. "Running doesn't scare me anymore. When I came here I was scared I was going to lose my scholarship or something." Not only is Kurgat one of the best runners in UAA history — the only other person in the conversation is Chelimo, a four-time national champ — she is a champion in the classroom. Kurgat carries a 3.58 cumulative grade-point average as a medical lab tech and nursing major. She was recently named to the Division II All-District academic track team and is in the running for a spot on the All-America academic team. During the cross-country season, she was named Division II's athlete of the year and scholar-athlete of the year. Kurgat said she plans to spend another summer in Anchorage. She has completed her eligibility in cross country but has one more season of track left. "I just want to graduate and see what the future has," she said. "Right now I'm focusing on school, actually." She has already established herself as one of the greatest runners in Division II history. At the Stanford Invitational earlier this year, Kurgat posted the second-fastest 10,000-meter time in Division II history — 32 minutes, 33.24 seconds. Three weeks later, Kurgat ran the fourth-fastest 5,000 in Division II history with a 15:43.95 at the Bryan Clay Invitational in Azusa, California. It was her first 5,000-meter race on the track in two years — she redshirted during the 2017 outdoor track season — and she slashed more than 45 seconds off her previous best at that distance. Kurgat was the favorite in both races at the Division II national championships May 24-26 in Charlotte, North Carolina. She won both in impressive fashion. In the 10,000, she unleashed spectacular speed in the final 1,600 meters to turn a three-second lead into a 35-second victory. In the 5,000 two days later, no one followed when Kurgat made her move earlier and no one could follow. She won by more than 11 seconds in 16:22.62. Though Kurgat said her focus is academics, UAA coach Michael Friess thinks she has yet to reach her potential as a runner. "I think she has a chance to do something really special," he said. "She was not really running much when she came over and has made huge improvements. She's got an opportunity if she keeps going post-collegiately. "I think she can get close to 31-flat in the 10,000 and sub-15 in the 5,000. She's got enough speed to support all of that if she can keep the consistency in her training and maybe tweak the volume." Friess sees no reason not to expect more great things from Kurgat as she heads into her final season of running at UAA. "She's healthy, happy and doing great in school," he said.